This is Part 4 of Staying in your lane. You can find Part 3, How to find 100 great customers, here. Have you ever sat down and stared at a screen, wondering when the ideas are going to come? Wondering how on earth you’re going to fill the blank document in front of you with something, anything that will be meaningful to your audience? Everyone who’s ever tried to write content has had this experience. Some have it more than others. The secret? If you’re passionate about what you do, the ideas flow much more easily. That’s not to say you don’t still experience writers block, but it’s rarer, and easier to overcome. Now, you might be struggling to join this to developing your messaging for your niche, but it’s actually super relevant. You’ve done the hard work already. The effort you’ve gone to defining your niche, figuring out how you serve their needs and solve their problems, validating that they exist, and working out exactly how many people you need to buy to make the whole thing work has left you with a pretty awesome opportunity. You’ve developed an offer you’re passionate about and targeted it to a group of people you genuinely believe in, so the messaging is going to be super easy. So, if it’s so easy, how do I do it? So how do you define your why from a marketing perspective? Start by thinking about your purpose - what is it that’s driving you to do what you do? This is really important, as this ticks the “you believe in it” box that makes the ideas flow from here on out. When I say think about your purpose, I mean exactly that. It’s not your customers’ purpose, or what you’re trying to help them with. No “I believe in helping people get the right life insurance” here. Focus on your purpose - what gets you out of bed in the morning? Make sure you’re really clear on this. Next, grab a sheet of paper (landscape orientation please). Write your purpose at the left, and the problem you’re solving for your target market at the right. The middle is for tying the two together. Take a look at your purpose, and then the problem (always start with your purpose!). Then start to think about concepts that tie the two of them together, and ideas that you have to explain these to your target market. Focus on single words that pull out different parts of your concept. Once you’ve done this, the next step is to fill out your “About us” style content. 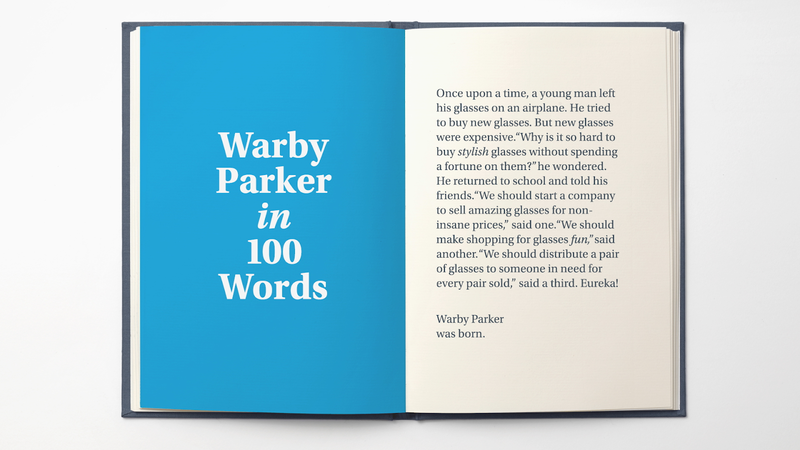 Once again, Warby Parker do it really well with their history page. Now you’ve got the core of your messaging nailed, you need to figure out how you’re going to tell the story. This is generally driven by the customer profile you have - whether they are businesses or consumers, their age ranges, their goals and everything in between. Head back to your customer profiling for a detailed look at how to build out customer personas. We won’t get into the full breakdown of how to build communications strategies for new businesses here, but the internet has a plethora of information on where to get started. Copyblogger, Hubspot and even some Youtube channels are good places to start looking. Now you’ve got your messaging nailed, you’re ready to move on to the next stage of owning your niche - growing tall, not wide, and scaling within your niche.